Friday June 11th 1909 I worked all day long washing up the floors after the plaster. I only stopped to get the meals with quick work. Saturday June 12th 1909 I washed in the forenoon and got a nice dinner by noon so Will went to town at 12.12 I went down home at 3.12 for a call. Ray walked to town with me. I came home at 5.12 got supper and had ironing done by nine oclock. Sunday June 13th 1909 I got up early for I had some baking and work to do I had left yesterday I was at work till after two oclock. I rested and read some before Ott & Fannie brought Ray & Millie out at four oclock. Hattie came an hour later. Ott and Fannie went back but the rest stayed for supper going home at 8.12. We went to the depot with them and I did the dishes after I came home. We enjoyed their visit very much. 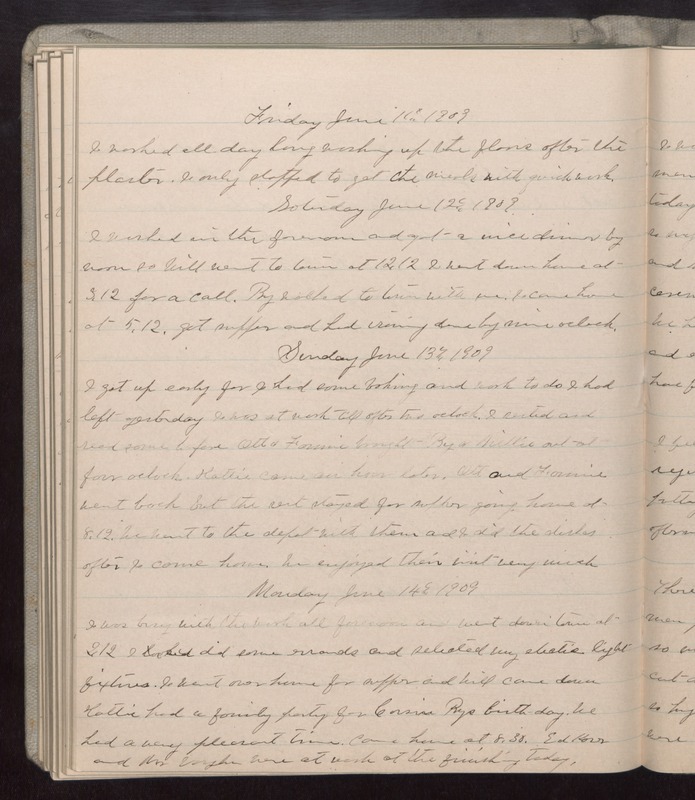 Monday June 14th 1909 I was busy with the work all forenoon and went down town at 2.12 I did some errands and selected electric light fixtures. I went over home for supper and Will came down Hattie had a family party for Cousin Rays birth-day. We had a very pleasant time. Came home at 8.30. Ed Korr and Mr Vaughn were at work at the [finishing?] today.